Growing up, the prominent option for dolls in the market were European dolls with European features, like Barbie dolls. The only other option was to make our own dolls with wool, bamboo, wood, raffia, and other materials. For a parent looking to offer his daughter, or niece, a “hip” doll, he/she basically had to get these European dolls that looked nothing like us (nothing wrong with that, but self-love starts with seeing one’s likeness in the most basic daily toy). Some of my friends resorted to coloring those dolls chocolate, so that the doll would look just like them, or braiding their hairs, and dressing them with left-over fabric from their Mommy’s wrappers or Boubou. I was quite pleased by the work of entrepreneur’s Taofick Okoya who created two lines of dolls: the Naija Princess, and the Queens of Africa. The Naija princess is more affordable for the average Nigerian family, and the Queens of Africa is the ‘haut-de-gamme’ of his collection. His dolls basically have ‘African’ features, and are from three of the main tribes of Nigeria: Nneka is from the Igbo region, Azeezah is Haussa, while Wuraola is Yoruba. The dolls all wear African clothing from their particular regions, and have their hairs in braids, Afro, or plated. It is simply beautiful. As Mr. Okoya said himself, he first started because his daughter was getting confused about her skin color wishing hers to be just like that of her doll. See… how, even as kids, we get brainwashed? This is where we teach young girls to love and appreciate who they are, their skin colors, and the gorgeous hair they were endowed with naturally and divinely. I am so proud of Okoya’s dolls, which has beaten Mattel’s Barbie on the Nigerian market, and are now sold around the globe. I raise my hat to him, and wish for him to keep up the work, and for others to make dolls more representative of our different cultures: i.e. having Maasai dolls, Bushmen dolls, Bamileke dolls, or making them more “hip” for our daughters. 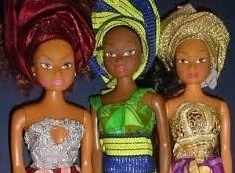 Please do check out the website of Taofick Okoya, Queens of Africa Dolls. I want to start up a on-line business selling african dolls; how do I go about this and can you supply the dolls. Dear May… this sounds like an amazing endeavor. One first step could be to contact Taofick Okoya, the founder of queens of Africa and Naija princesses dolls. Thank you for responding to my query; I will keep you informed. You are welcome. Just let me know if you have any other questions.